For all of us drummers out there trying to make a living by teaching private lessons we all know that it is no easy task. You might live in a small town or in a thriving city with a lot of competition. The name of the game is to be able to get noticed and to put your name out there for others to find out who you are and what you do. I am from a small town in North Carolina where I am the only private drum instructor, yet even though there are no other competitors it’s still a hard task to sell yourself to the community and make your presence known. Drums seem to be loud, expensive, and every parent’s nightmare right? 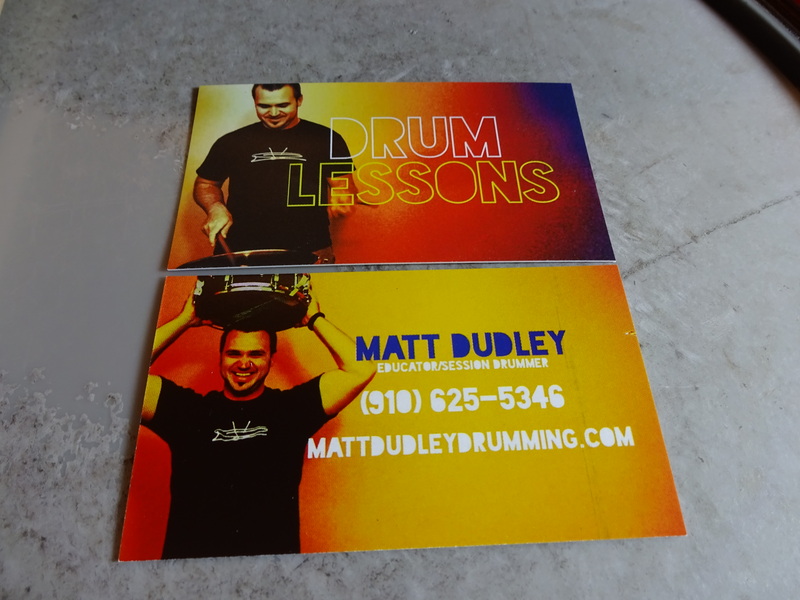 With that being said I decided to write this post Marketing Your Drum Lesson Business Using Business Cards to try to help those of you in the drum community that are trying to make a living teaching drum lessons. It has been a long test of trial and error for me and this is something that I have seen positive results with in my own business and I want to share what has worked for me. This post is solely based on my experience with using business cards over the past 12 years. I hope that this post might help you in your journey. A plain business card is just like a needle in a hay stack but a personal one will grab you more prospects! Think about how many times you have seen business cards next to a cash register. Now think about how many times one has caught your eye enough for you to stop and read the information on the front. It rarely happens cause they all start to look-alike. Why not try to make that business card into an eye catcher! 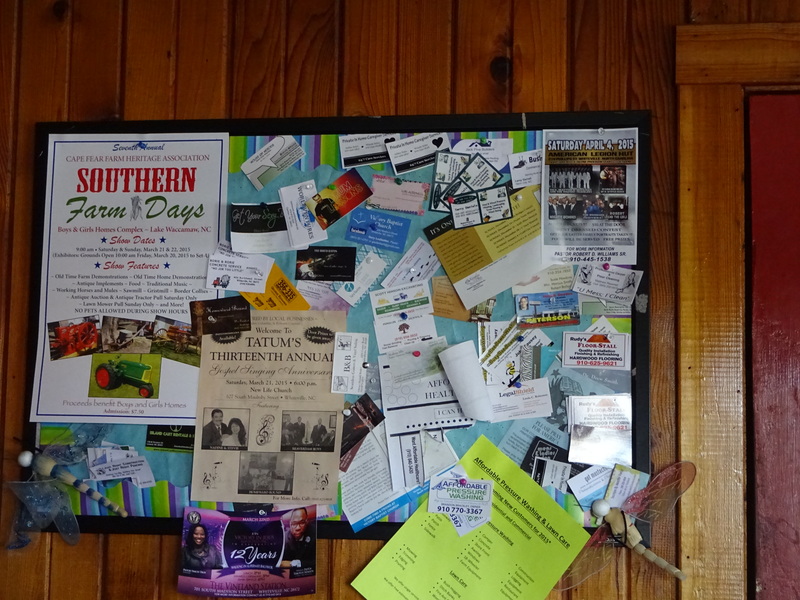 I have found that business owners are more inclined to let you leave cards next to their register than they are to let you tape up a big gawky flyer on their window. With cards there isn’t any tape or residue to clean up after the flyer has worn out its welcome. The business owner can simply remove them from the card stand and toss them in the trash if need be. Make your cards personal! This is your micro billboard so make it catchy and to the point. Simple is the best and it took me a while to figure it out. My first cards where plain white stock with black lettering (see below), you know what I’m talking about? Boring, cheap, and just enough to say that I have a card. I took another shot at it the second run and made them black with just my logo in red and my website address below… still not many phone calls. 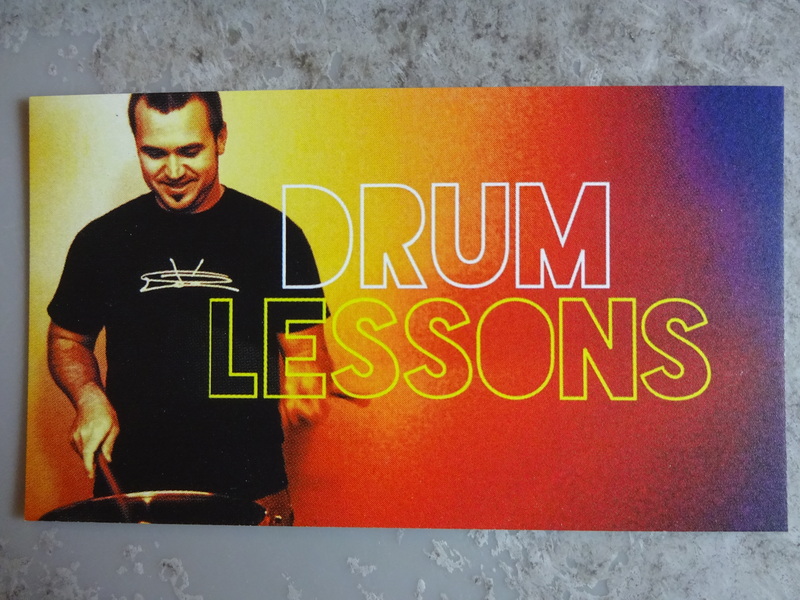 My newest cards… bright colors, me playing a drum on the front, the words “Drum Lessons” in massive letters, and a cool “kid friendly” font. Now we’re talking! I ordered mine from vistaprint and supplied my own custom design using their “matte” finish. The price was a little steep at just over $80 for the first 1000 because of the additional one time setup fee, but I received my second run at a discounted price because vistaprint always has some sort of special deal each week. I received plenty of phone calls from these little guys because it’s hard to miss even in a library of automotive, home improvement, and lawn care provided businesses. What are you trying to sell? Providing a “call to action” somehow on your card gives people a definite answer as to what your service is. You can make this call to action in bold text, with a pic, or a logo. Be specific and make it appealing to all ages so that you are speaking to a broader audience. When providing contact information you want to have the basics of course but what is too much? You want to list just enough contact information to be effective! I chose to list only my phone number and website. The reason being is because I know most people will call if they are interested and I also wanted people to visit my website, which has all of my contact information, social media links, and directions to my studio through Google maps. Most people will call, text, or email you if they are interested in your service so definitely provide a phone number and email address. Again I left off my email address because I listed my website where you can easily find my email, that’s completely up to you what you choose. If you do list your email please be sure to create an appropriate email address for your business. 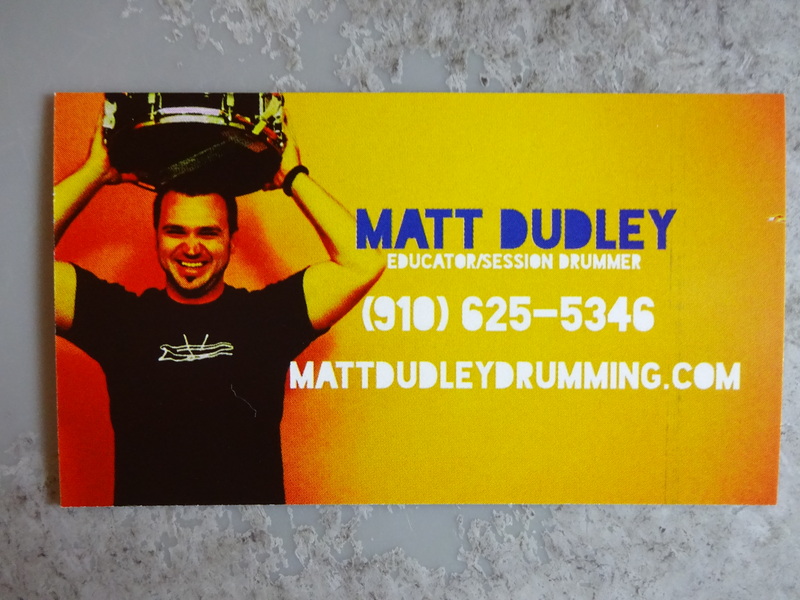 You don’t want to be advertising for drum lessons and have the email dungeonlord76@hotmail.com lol! You also need a website/landing page of some kind that provides more information to the potential client so if they want to look a bit further into what you do as an instructor before they contact you. If you want to list a social media platform then list the one you are most active on with your business such as “twitter or Facebook”. Listing your street address can be optional if you provide that information elsewhere. Again that’s up to you. Who are you and what is your job title? You can also pair up more than one title. Since I not only teach, I also listed that I do session work which can also be valuable if someone is looking for a drummer for hire. Where should I purchase my cards from? With technology these days there isn’t much you can’t do on your own in the advertising world. You can easily create and print custom business cards from the comfort of your home. There are many different apps and software packages that give you so many options to create the card of your dreams. Where I live there are a few print shops that will easily do 1000 cards for $35. The only trick is that it’s normally for just your plain basic white/black text card. If you go any further with graphic design then be prepared to pay a little more depending on the print shop’s rates. Online business card design in my opinion is the most popular at the moment and you can easily make your cards exactly the way you want and cut a few corners to save money at the same time. There are so many options that you could spend hours fiddling and designing. How many cards should I purchase? My answer to this question would be how large of an area are you covering, or are you just going to be passing these out to people you meet and shake hands with? If you are using your cards as flyers to leave at businesses then you at least want to order 1000 cards. If it’s just to share contact information after a handshake then I would go with 500 cards. Now that you have spent hours of designing your cards they have finally arrived! The hard part hasn’t even begun. Now you have to distribute those cards and get your business out there to the masses! Check your calendar, the weather, your gas tank, pick some comfortable shoes, and dress appropriately cause you are about to get out there and represent your business! High traffic businesses such as gas stations, restaurants, hair salons, and clothing stores. Got that voice in the back of your head telling you that someone is gonna reject you and your fancy little cards? Good! You will need that as fuel because you are going to hear that word numerous times on your journey into marketing yourself. There is nothing to be afraid of and in the long run you have to remember that you are building confidence in yourself and your business by accepting that rejection and moving forward. Just remember you have to eat and pay bills right? Well…. There ya go. How do I approach a place of business to ask if I can leave my cards? This normally scares people to death because this is the first step to pitching your business to a potential client. Who know’s? The person you are asking to leave cards with might know someone who wants lessons, or if you leave a lasting impression on them they will remember to tell their friends. When you walk in make sure you look and act professional. Treat this moment as if it were a job interview! – If they say yes take out a portion of about 10 to 15 cards and ask where they would like for you to place the cards. – Don’t forget to thank them and tell them just a brief description about your services, and leave a positive impression. Even if that person isn’t going to be taking lessons they will remember a friendly face and pass that on to someone who is looking for lessons later down the road. Remember, you are selling yourself to your community. I have had so many businesses turn me down when asking if I can leave cards. “We don’t allow people to leave cards”, “If I let you do it then everyone else will want to leave theirs”. Take that “NO” with a grain of salt and keep pushing forward to the next business. I promise there will be a “YES” right around the corner. Don’t give up! You determine your own success and you can’t be successful by giving up. When passing out cards make a list of all of the businesses that you leave your cards at, this will be important to remember so you can go back and refill as time goes by. There is also a plus to knowing which card location is doing the best. When a potential client calls or sends you an email ask them how and where they found out about you. By doing so you can figure out where most of your traffic is coming from, kind of like analytic’s. You did it! All of your cards are out there in your community waiting to be seen and passed around. Don’t worry if your phone isn’t blowing up within the first few days, sometimes it takes weeks for potential clients to sit on the idea of taking drum lessons. Parents will have to discuss the idea with each other and their kids, and the older guy or gal looking for a hobby has to find out if they have the time to fit private lessons into their busy schedule, and the money. Hang in there and keep repeating this process of distributing your cards. Order more and branch out to other surrounding counties, and cities to spread the word. You want to keep these cards out there in the public eye so try to make this a normal routine at least every other month. It gets easier each time and you gain confidence as time goes on. Good luck! ← 7 Days Until The Release Of Benny Greb’s New DVD “THE ART and SCIENCE of GROOVE”! Good article Matt. 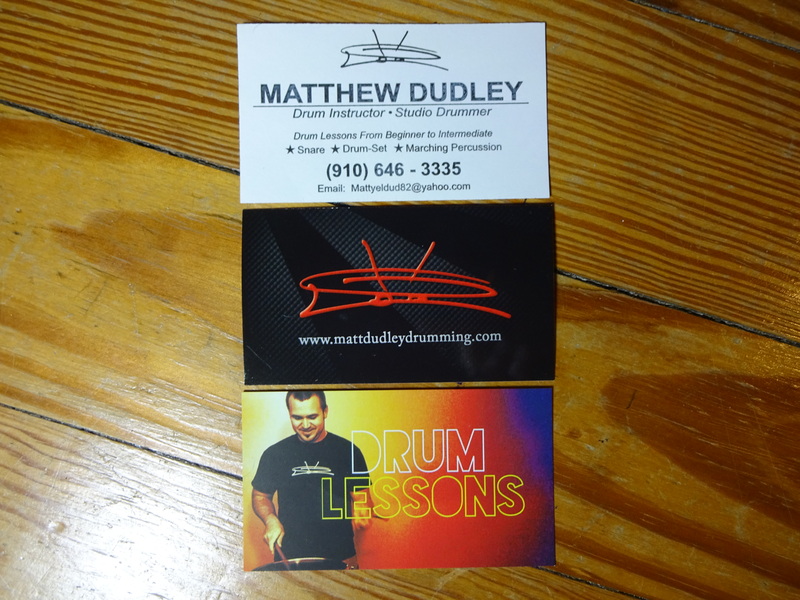 I’m in the process right now of designing some new business cards for my drumming business. This really helps. Awesome! Glad this helps man! Let me know if you have any questions.id be down help anyway I can.